Katie Harris, the school social worker, already has one crucial job. A school social worker helps students with any sort of struggle that may occur in or out of school. Harris prides herself on loving her job and the students of BV West, but it is certainly a special case in the way she can connect with the students. with her organs, causing Harris to spend her time in a wheelchair. 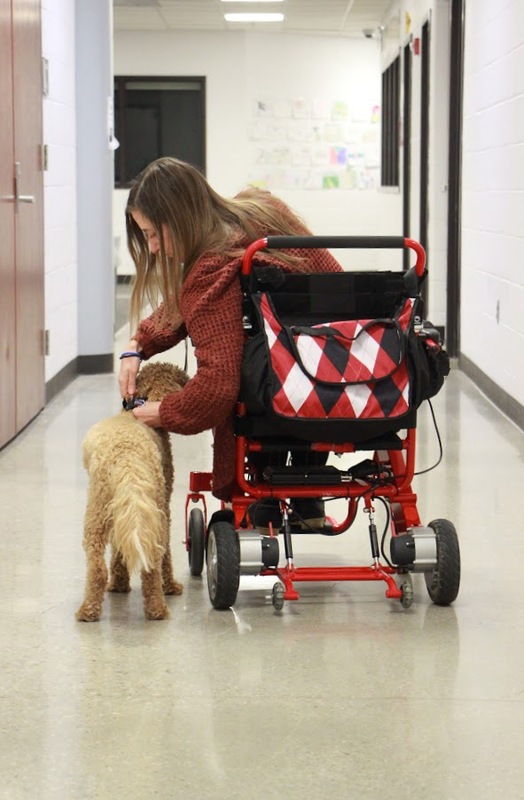 In the beginning of her diagnosis, Harris had decided to get a goldendoodle puppy, Moxie, not realizing the impact Moxie would have on her life. With all of Harris’ family living in St Louis, Moxie seemed to be necessary addition into her family. Harris and service dog Moxies story into an intense journey together. Some may say the timing was meant to be with Moxie. Although having and training a service dog hasn’t been all fun and games. 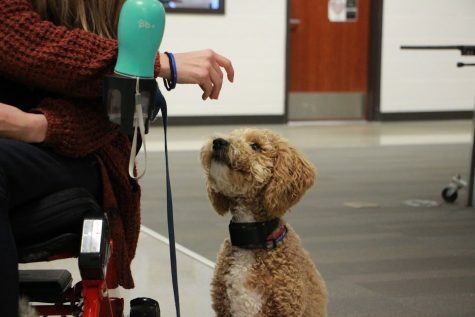 Moxie soon began training to become a service dog after Harris’ health problems worsened. Harris feels her personality is a perfect fit for her. As for getting adjusted to her new job, Moxie seems to have gotten the hang of it, to say the least. Moxie went through service dog training and continues to train as a therapy dog. She helps Harris with simple commands such as opening wheelchair accessible doors, picking up any dropped items, and to be on alert if any red flags arise with Harris’s health. 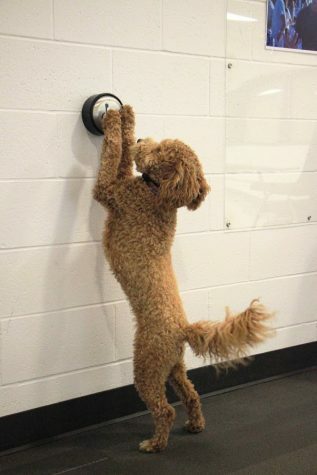 “She’s also in the process of being trained for a canine phone. It’s a little phone with a little button, and she’ll call 911 if she pushes the button” Harris said. For Harris, a moment when Moxie started making noticeable progress in her training has stuck with her. Moxie has not only been able to light up Harris’ world, but the people she has met along the way. Even outside of school, Moxie helps those who may need it. Currently, Moxie and Harris are continuing to train with some bigger, brighter plans down the road. Harris plans to host a fundraiser to help those pay for the cost of service dogs and the hefty training that goes with them. “A lot of people are so severe, they need a dog that’s fully trained immediately. Those are a lot more money, like $20,000 to $30,000, so we are very fortunate that I got her for not for that much money and the people working on her training are doing special things to try and help with the financing. Moxie and Harris’ have had a large impact on the school and on each other. They continue to learn more about each other and their personalities and help each in any way they can. One paw or two. Perfecting her ability to open the door for owner Katie Harris, Moxie fails when using just one paw but is successful on her next attempt when using two paws. “With this diagnosis, and the physical complications have been really really tough and she is giving me a different focus and more of a passion and purpose. Moxie helps emotionally just as much as she does physically with it” Harris said.